Horses from courses UK tour. 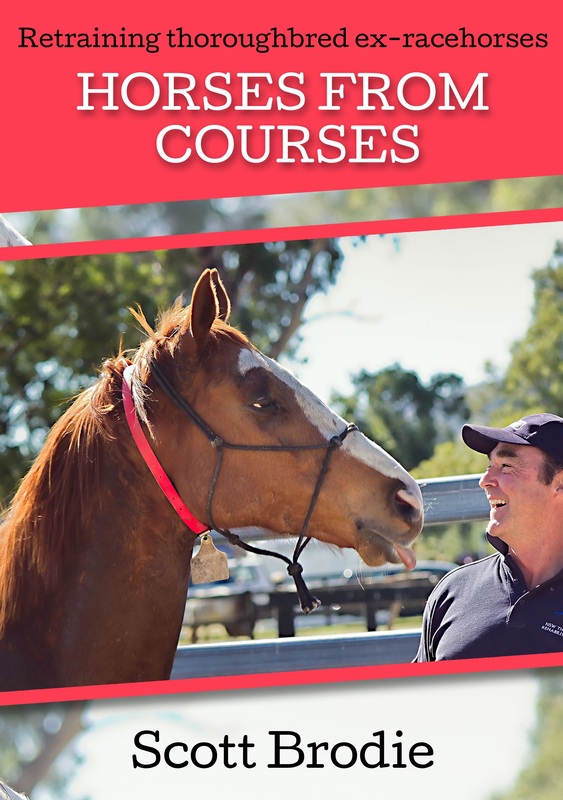 Since the release of my book, Horses from Courses, last year, I have found myself much more involved in the retraining of people than ever before in conjunction with retraining of ex-racehorses. This is where the future of the OTTB (Off the track Thoroughbred) rests, in the hands of those willing to put the effort into assuring there is somewhere to go and something to do at the end of the horses’ racing careers. 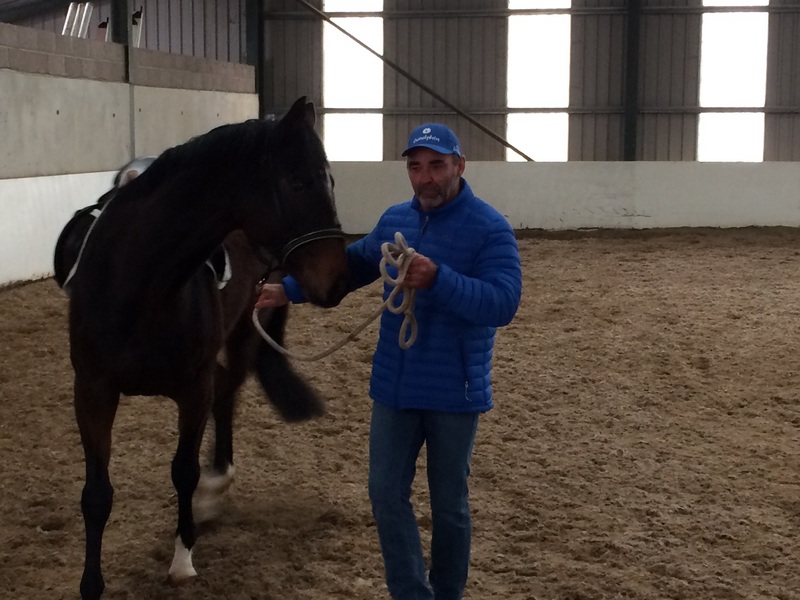 On my recent trip to the UK, I was able to take part in an exchange of ideas with some of the longest serving and best known Thoroughbred retraining and rehoming programs in the world. 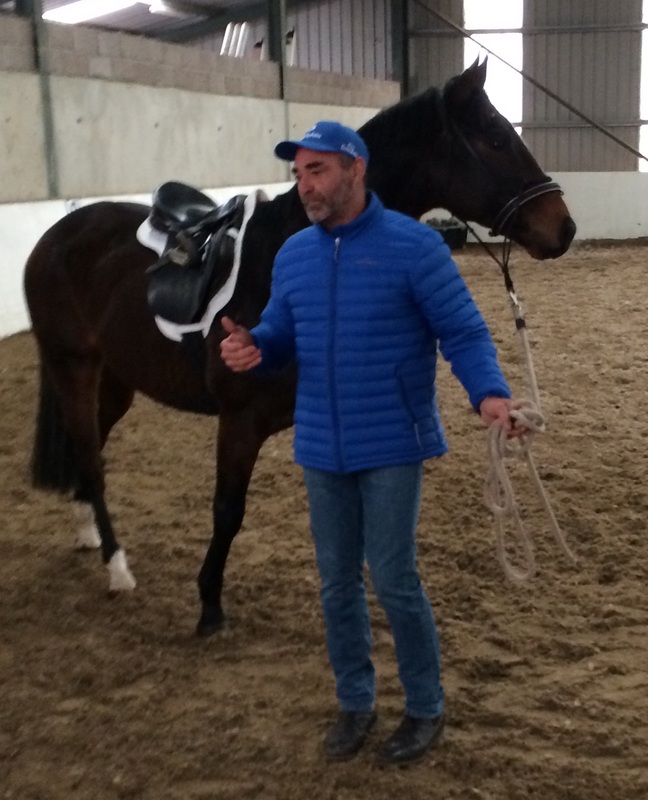 I visited the Godolphin Retraining Centre at Newmarket England, where I toured the facility and gave a somewhat impromptu demonstration of my Horses from Courses/TRT (Thoroughbred Rehabilitation Trust) training system. Godolphin, from my experience, is the most responsible Thoroughbred racing and breeding organisation in the world. 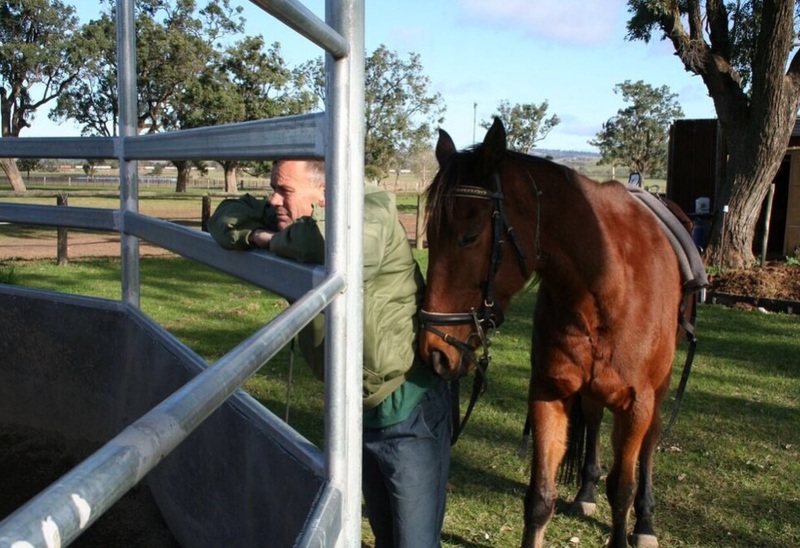 They do everything they can to ensure their horses are well looked after from birth to death. The Godolphin Retraining Centre has 12 horses in work at any one time with a small paid staff, as do we at TRT, and like us, numerous invaluable volunteers. Godolphin has knowledgeable and committed staff, as do all rehoming programs. Whilst there, I did some work with the staff and a couple of horses, introducing them to my simple systematic approach to retraining and as I always explain, I have invented nothing. 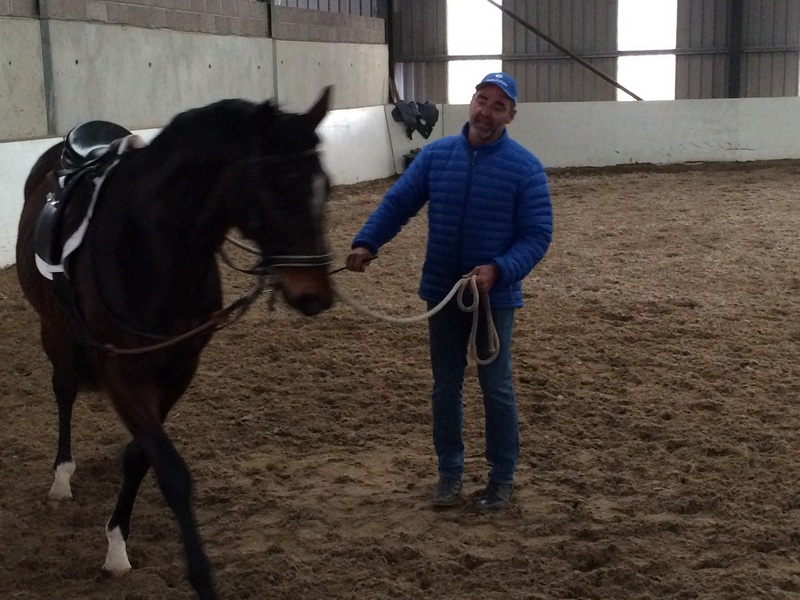 All I have done is take a very effective and relevant training technique and put it into an order which by virtue of its simplistic step by step nature, makes retraining horses off the track simple, effective and efficient. You don’t take the next step until you have solidified the previous step. Godolphin fund the program at Newmarket and horses are virtually given away at the end of their training. Only a very well funded organisation, with a serious conscience, can and will do what Godolphin do for their horses. 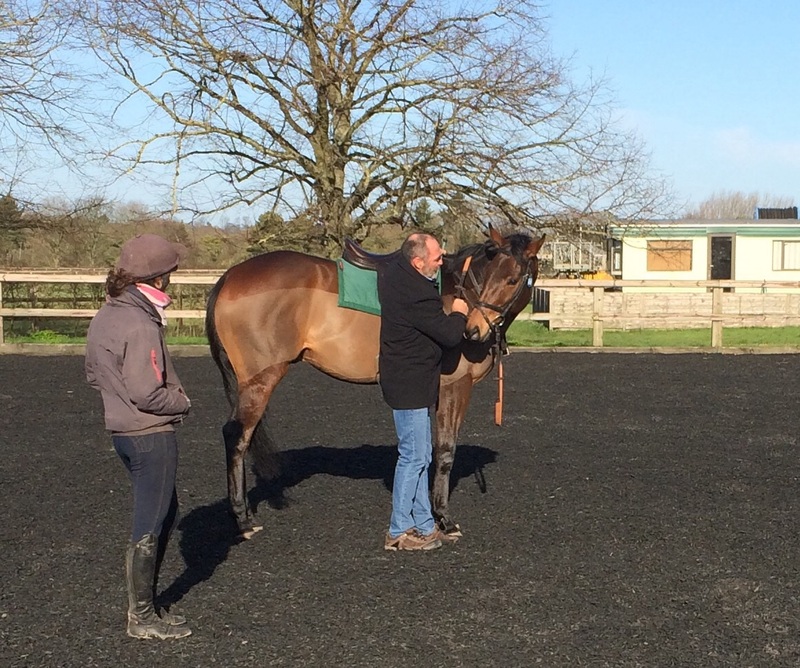 Next stop was Lambourn, two hours drive south where I met with Di Arbothnot the CEO of ROR (Retraining of Racehorses). This organisation is committed to the cause with a strong focus on developing the perception in the less accepting UK market that Thoroughbreds can do well in the general equestrian world. ROR is privately funded through sponsorship and donations and they run competitions specifically for Thoroughbreds as well as training clinics for those interested in rehoming. Di introduced me to Grace Muir at the HEROS (Homing Ex-Racehorses Organisation Scheme) organisation. 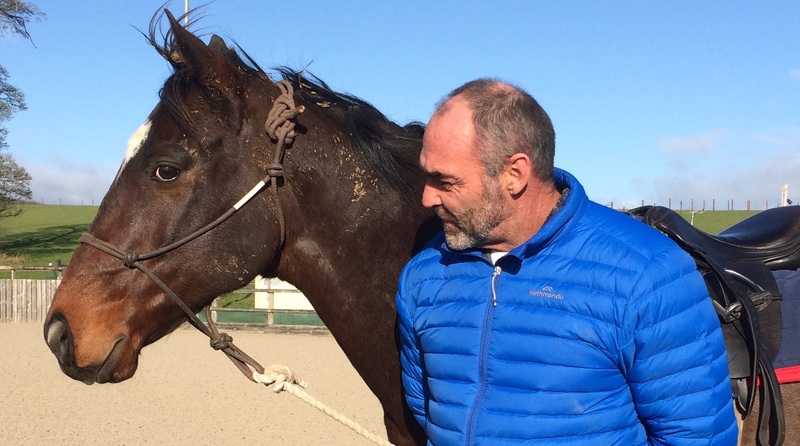 HEROS retrain ex-racehorses and find them new homes. The horses from HEROS go out on a lease arrangement and are followed up throughout their lives after racing. At Lambourn, I gave a full demonstration to the ROR and HEROS staff and it was very well received. 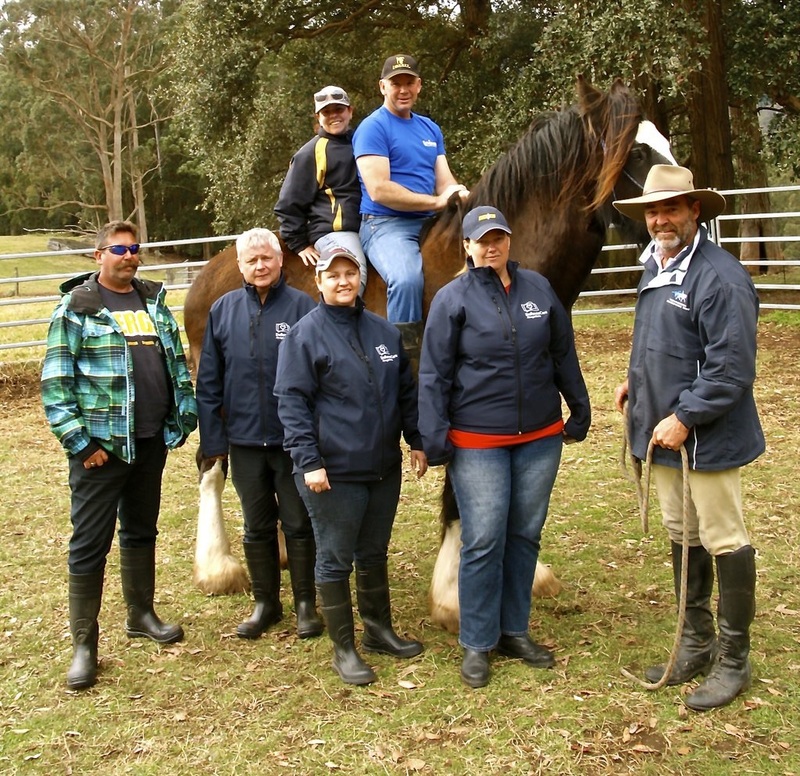 The educated horse people of these organisations saw immediately the simplicity of my system and recognised its value for the retraining community. I have been invited back to do some training with their staff and run a clinic and demonstration for the general public. The horse I worked at Lambourn had been diagnosed with kissing spine. This seems to be the most recent catch phrase amongst the equine community in the UK. Put simply, horses who don’t carry themselves correctly, engaging their core and lifting up toward the carried weight, finish up with hollowed backs which in time can lead to the process of the spine compacting, thus causing discomfort and pain. I am, as was Grace at HEROS, a strong believer that correct riding and training can eliminate the oinset of kissing spine and go very far to rectifying the problem should it already exist. Had I not been told about the horse’s diagnosis, I would never have guessed, as when asked to hold himself correctly, there were no symptoms. My final equine engagement was with the IHWT (Irish Horse Welfare Trust) at balcultry stables in Swords, just north of Dublin City. As with England, Ireland has a perception issue with the idea of using Thoroughbreds for purposes other than racing. Their rich equine heritage, spanning back thousands of years, has seen the development of horses for every purpose. The niches filled by Thoroughbreds in Australia are well serviced by several different types of purpose-bred animals. 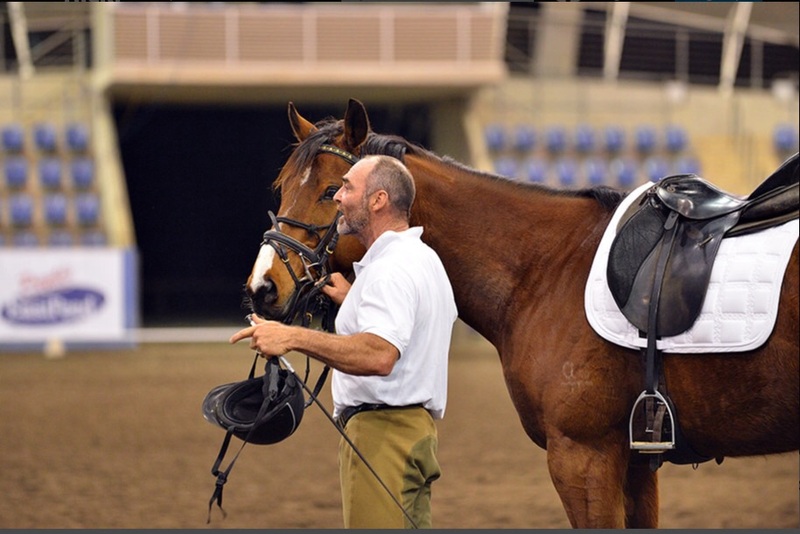 Along with developing an accepting OTTB market, IHWT recognise the need for training and support of those who are interested in taking a horse off the track. I presented a demonstration/clinic to a committed and focused audience. 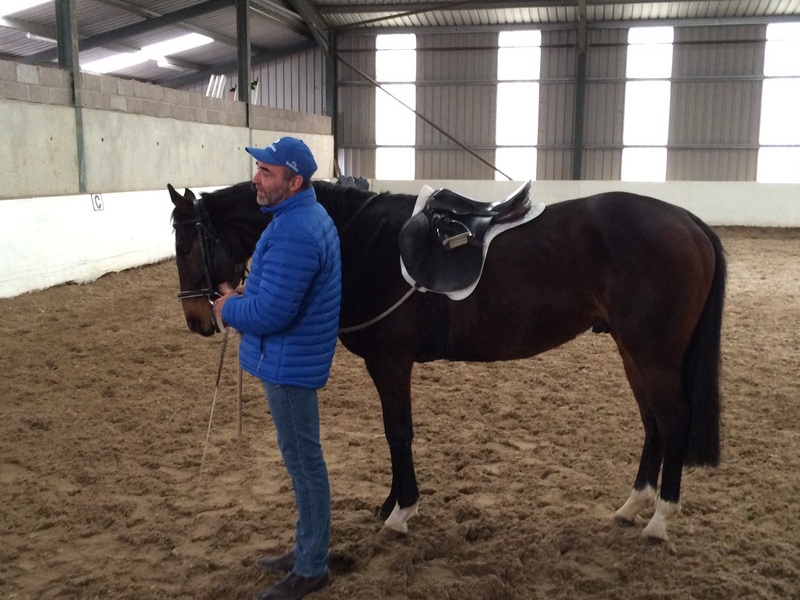 Working with one horse who had already had some work after racing, who exhibited the familiar traits of those we receive at the TRT, had already been started by those well-meaning, but maybe not quite as qualified as required, owners/riders. I often describe these horses as a handful of tangled fishing line; it can be difficult to unravel the tangles already created. The horse was very nice, as were his new owners and with commitment to what I showed on the day, they should finish with a good result. The second horse was straight out of racing and presented a great opportunity to show the effectiveness of my training system. He was a dream and flowed along through the process without incident. It’s often embarrassing how simple the system can be and it was good that everyone knew I had never seen the horse before the clinic. They may have otherwise questioned whether I had spent several sessions with the horse tuning him to my methods. 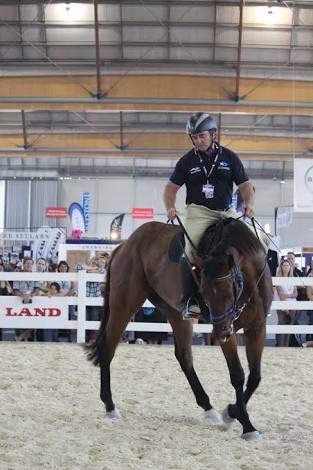 Overall the tour was a great experience, I met very well meaning horse people I hope to work with in the future. I was made aware of the variations of circumstances facing the Thoroughbred rehoming communities in different countries. And I came away confident that my ‘Horses from Courses’ retraining system holds up very well on the international stage. It made me very proud of my staff and volunteers at the TRT. Thanks to all of you for your ongoing efforts. On my recent trip to the UK, I was astounded to see variations in horse cultures from countries with a common ancestry. I would like to discuss specifically, the variations in relation to the perceptions of the Thoroughbred horse and how those perceptions and history influence the best practices for organisations committed to the welfare of horses at the conclusion of their racing careers. In Australia, the Thoroughbred has always been recognised as a competitive equestrian and pleasure horse, as well as a supreme racing athlete. The Thoroughbred is a relatively new breed of horse, beginning its development only 400 years ago and has been in Australia for the country’s entire equestrian history. It is the foundation of the only recognised Australian breed, the Australian Stock Horse. Up until only 20 years ago, Thoroughbreds were double registered as Stock Horses and Thoroughbreds. The Stock Horse foundation has some of the best racing blood in the world. When Australia burst onto the international equestrian scene, they did so on the Thoroughbred. Our second Olympic Games, brought us three equestrian medals; two gold and silver all on the backs of Thoroughbreds. From that time forward, the Thoroughbred has been the backbone of Australian equestrianism. Up until recently, the Thoroughbred was trained to the highest level in dressage, show jumping and eventing. The introduction in any serious way of the European Warmblood and other foreign breeds is relatively new, occurring in the last 30 years or so. A market for the Thoroughbred exists and always has. Some damage to the market has been done by the introduction of the foreign breeds, but largely, Australia appreciates and utilises the abilities of the Thoroughbred. 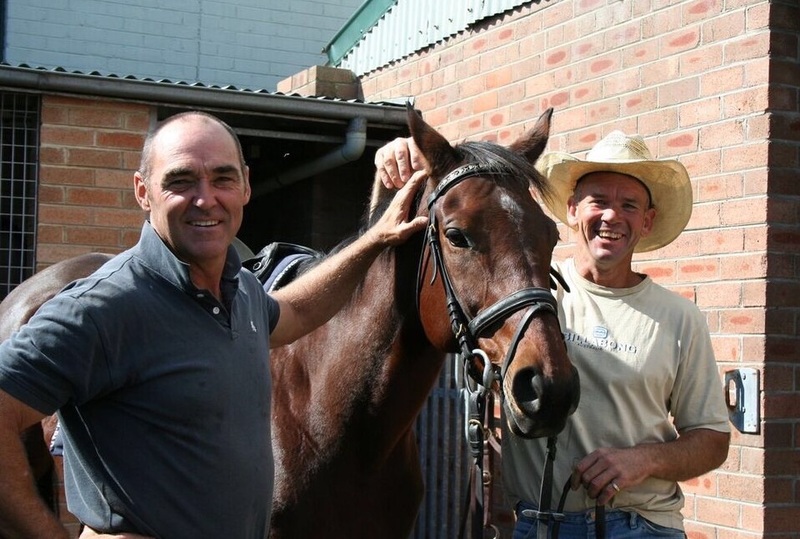 The focus for the rehoming of Thoroughbreds in Australia needs to be education of riders, particularly those who have been influenced by the current fashion of the foreign breeds. Professional retraining of Thoroughbred horses, in numbers that can supply the hungry market and to a lesser extent, the renewed promotion of the Thoroughbred as a competition and leisure horse. The UK has an historic and rich horse culture that goes way back before the advent of the Thoroughbred. In fact, in the 10,000 years of history of the UK, the Thoroughbred is a very new addition. Breeds have, over the millennia in the UK, been developed for specific purposes, such as, war horses, Draft breeds, riding breeds, carrying and carriage breeds. Purpose bred horses in the equestrian environment of the UK. Top left the Irish sport horse, top right Spanish breeds found there way into the UK with the Romans. Bottom right the ancient Cleveland bay developed as a load carrying horse. The original English-bred horses were combined with an infusion of Arabian blood only recently, to develop the speed and stamina of the modern Thoroughbred. The Thoroughbred has not been needed for any specific purpose, other than racing. Only in recent times were these three foundation stallions added to the equestrian landscape in order to develop the modern thoroughbred. So in the UK, the Thoroughbred is a racehorse, the Irish sport horse is great for jumping, hunting and eventing, the European Warmbloods and Spanish breeds suit dressage, with various breeds of ponies and mixtures of the aforementioned breeds having served as pleasure horses. There has been no need to bring the Thoroughbred into the equation. Now with large numbers of Thoroughbreds leaving the racing industry and with greater expectation of the population in relation to horse welfare, Thoroughbred rehoming organisations in the UK need to promote the use of the Thoroughbred in the various equestrian fields. Money is being spent promoting competitions featuring Thoroughbred classes and awards are given for Thoroughbreds excelling in open competition. 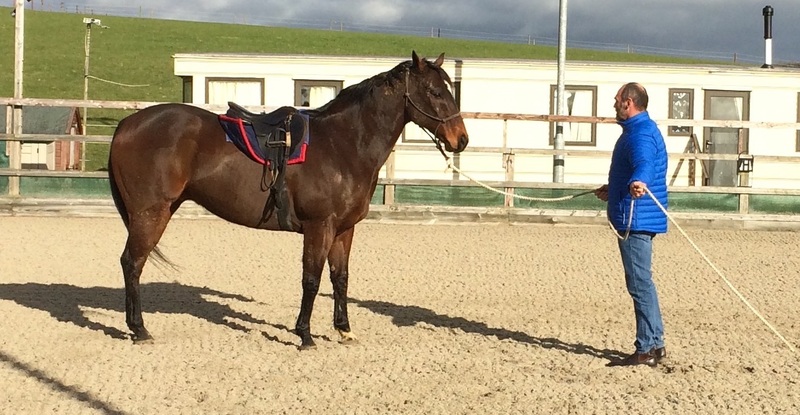 This needs to be the main focus of this rehoming market, but it needs to happen in tandem with an educational focus giving potential Thoroughbred owners the tools and support needed to make the rehoming of these ex-racehorses an enjoyable experience. So two surprisingly different market places. Australia with an existing market, requiring a focus on education and supply to the market and the UK still in the process of developing an accepted and viable market, but also with a requirement for education and support for that market. I have been retraining Thoroughbreds for nearly 30 years and it wasn’t until I visited the UK recently with a focus on Thoroughbred rehoming, that I became aware of the acute differences in the horse cultures and the varying requirements in the field of Thoroughbred rehoming throughout the world. Each market must be assessed and focused on the most relevant issues in its unique environment. There is no doubt that each market in each country with a thoroughbred industry will face its own challenges and must develop strategies to siut their particular needs. 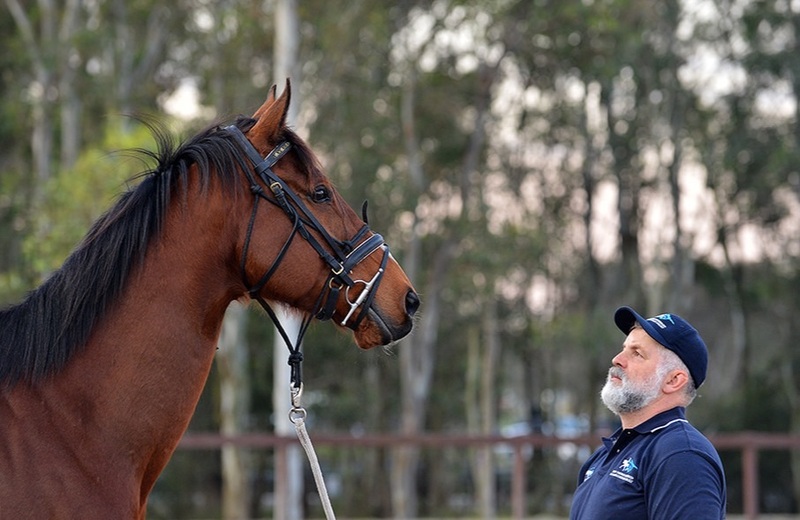 Education, training and support are esential elements of any thoroughbred re homing program . Largely, I think a three-pronged approach of establishing a market, producing a product and then developing an industry around the development of the product, is the way forward for the Thoroughbred racehorse. Rehoming industry, these three elements will be required in all environments but each in varying portions determined by the individual market places. Personally, I am happy to be involved in such a worthy cause in a positive way, it’s disappointing to see some of the passionate anti-racing organisations wasting their energies in a negative way, rather than working positively to produce a better outcome for horses at the end of their racing careers. Over the following weeks, Mairinger had the complete attention and dedication of the four men and horses. The practical lesson at the train track had done the trick, and now the men were open and ready to learn the finer points of the art of riding. When one has been successful at what one does, it is very difficult to surrender to the idea that it may be worth changing one’s mindset in order to rise to another level, but the men had handed themselves over to their coach – it was all or nothing. Soon they began to apply the dressage lessons taught by Franz in a practical sense to their jumping and they were all becoming truly formidable, competitive riders and at this rate, they could challenge the world. The day arrived to load the horses aboard the ship, which would transfer them to Europe for the final preparations leading into the Rome Olympics. The men and horses had been worked hard in preparation up to this point, so they could use a break and the boat trip should be just the trick. Horses are prone to travel sickness and many had been lost at sea over the years. In another time, our ancestors on their battle ships, would cross tie horses and exercise them in Piaf to keep them fit and occupied. “After a trip like this and being locked up for 10 weeks, I just hope they don’t get crook.” replied Roycroft. The men followed Mairinger into the belly of the ship. They arrived in a cavernous area adjoining the engine room where a line of portable stables had been set up in order to house the horses. A small riding area, oval in shape about 20 x 30 yards had been erected. The heat and humidity was immediately apparent and the noise from the engines was rhythmic and punishing. Just standing there saw beads of sweat form on the men’s foreheads. As drops of sweat dripped from their confused faces, the men looked to Mairinger. Surely he had not requested this location to work the horses? “This will be perfect thank you.” replied Mairinger. The employee left quickly and was happy to get out of the noisy, hot environment. By the end of this journey gentlemen, our horses and yourselves will be prepared for the worst heat and humidity that a Roman summer can offer and the roar of the crowd will seem but a whisper. The 1960 Roman Olympics will come but once. Every minute between now and when we compete at these Games, must be utilised. We have but one chance to get this right. The rest of the men followed by removing their shirts down to their singlets and proceeded to tend to their horses. The men had committed themselves to Mairinger and though they would not generally work horses in this environment, it sounded as though there was method to his madness. Mairinger was seated at a dinner table, awaiting the arrival of the other men. The four men sit waiting to be served, all four feel a little guilty at their comfortable surroundings whilst Neil was down at the stables tending to his horse on an empty stomach. The men inspect the menu, “Grub looks good, doesn’t it fellas?” asked Morgan. “You’re not hungry Bill? Is something the matter?” enquired Mairinger. The five men, with an assortment of pillows, blankets and makeshift beds, sat around on the floor of the stable block, eating the food they had carried from the dining room. The horses stood with their heads out of their stables seeming to be joining in on the makeshift campsite. During the period of travel on the ship, the men and horses worked with a renewed intensity. There was an air of motivation, exaggerated by the extreme conditions and the certainty that no one else would be putting in the effort that they were. Over time, the combinations became accustomed to the difficult conditions. It was certainly a stroke of genius by Franz to continue the schooling on board the ship. The hot conditions would no doubt help with acclimatisation and this certainly would give the horses an advantage when working in the humid hot conditions in Rome. At times, the horses in the arena seemed to work to the rhythm of the pounding engines, the rhythmic commotion had become nothing but background noise and the horses worked harmoniously as though they were in the serenity of their home arena. Work in hand is used extensively to develop greater collection of the horses and they were working well above the level required for the Dressage phase of the 3 Day Event. Mirrabooka and Neil Lavis had come along in leaps and bounds and Franz could see that with work and time, they could make a formidable combination, even at Grand Prix level. The voyage was finally over with the horses arriving in England. In the unloading process, it could be seen that they were supremely fit and keen to get out and stretch their legs in a more natural environment. This was a delicate time, as an injury now could derail the entire effort. Morgan was supervising the operations of disembarkation and was bordering on rude with his direction to the dockworkers. The first horse on dock and the last horse on deck would be the most difficult, as for a short period, each horse would be left alone. Roycroft’s horse, Sabre, was first to be unloaded and was agitated and whinnied loudly. However, Bill with his confident handling, controlled the situation until the next stable mate joined him on dry land. Mirrabooka was the last to disembark and it didn’t come as much of a shock, that as long as his man Neil was with him, he remained calm and relaxed. The job was complete and the men were very relieved. Horden replied, “I don’t think you understand Franz, this is a political situation. We are in England with the Duke’s support and he has influenced the Australian Olympic Committee quite a bit. We can’t afford to offend him. Franz was not impressed at the pressure being applied; after all, he had only the welfare of the horses in mind. For the competitive Australian riders and horses, just turning up would be more of a challenge than riding flat out. It would be a day for control and discipline.